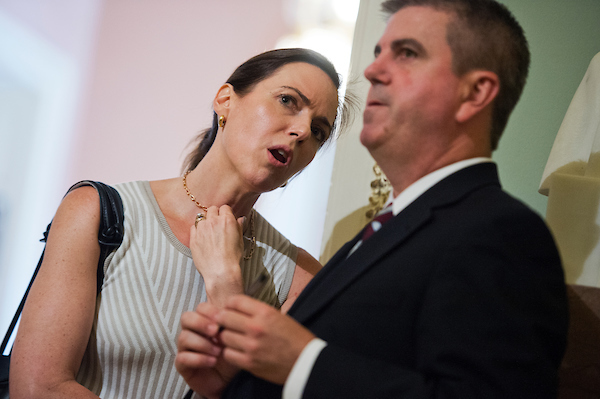 Antonia Ferrier is moving on from Capitol Hill, but she isn’t totally done with politics. “I will definitely keep my toe, if not my foot, in politics,” the veteran staffer said in an interview at a coffeeshop downtown Thursday. She’s still figuring out exactly how she will continue to help the Republican team, and for now is looking forward to her new role off the Hill in public affairs. 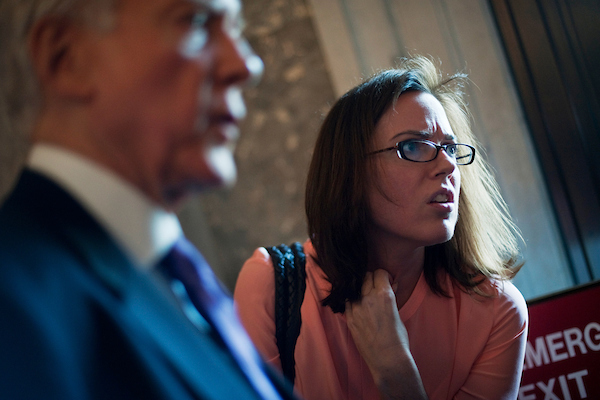 Ferrier has left her job as a communications adviser to Senate Majority Leader Mitch McConnell to join Definers, a firm founded by Matt Rhodes, who ran Sen.-elect Mitt Romney’s 2012 presidential campaign. The firm applies campaign-style communications strategies to other industries. Ferrier has tried to leave the Hill before, joining the lobbying firm Forbes-Tate in 2014. But she was drawn back to the Senate in 2015 by the prospect of working for McConnell and the new Republican majority. This time, though, she’s ready for something new and felt the timing was right as lawmakers transition to a new Congress. Ferrier has had a busy four years in the Senate since becoming the staff director for the Senate Republican Communications Center in early 2015. A constant presence around the chamber, she focused on promoting the GOP agenda and working with reporters who lurk in the Senate hallways. President Donald Trump’s election that ushered in unified Republican government further raised the stakes, and Ferrier cited the tax overhaul and the confirmation of two Supreme Court justices as top accomplishments. But like the lawmakers they work for, Ferrier and other communications staffers at the Capitol have had to adapt to a new and unpredictable environment where an early morning tweet from the president can drive the news cycle. She said one of the most important lessons she learned from McConnell — who has a reputation for being relentlessly on-message — was how to stay focused. “Yes, there is a lot of incoming, but stay focused on what your priorities are,” she said. Ferrier, who has seen her share of partisan battles during her time on Capitol Hill, has had the unique perspective of working in personal, committee and leadership offices in both chambers. She started her Hill career in the Senate, working for Sens. Bill Frist of Tennessee and Olympia J. Snowe of Maine. She then moved over to the House, eventually working for House Minority Leader John A. Boehner. She found her way back to the Senate, joining the Finance Committee staff. But it was during her most recent stint in the Senate working for McConnell that she faced a battle of her own. In early 2016, Ferrier was diagnosed with an aggressive form of breast cancer. She kept working for McConnell even while undergoing treatments at Duke University, describing her job as a “life boat” that kept her mind off her illness. And there was plenty to keep her busy — while she was battling cancer, senators were engaged in a fierce fight over President Barack Obama’s Supreme Court nominee, Merrick Garland. Asked if she had any advice for Hill staffers facing illness while working in a demanding environment, Ferrier suggested finding a community of people who have gone through it, too. The following year, Ferrier found out she was cancer-free. A few months after her last treatments, the Senate had passed the so-called 21st Century Cures Act, which included funding for a “cancer moonshot.” The research funding was named in honor of former Vice President Joseph R. Biden’s son who died of brain cancer, and Biden presided over the vote. She said the “little moments,” like a picture of her between McConnell and Biden, and getting a hug from Biden that day, are memories from her Hill career that she will never forget. Asked what she would miss most about working in Congress, Ferrier cited the strong sense of community and purpose on the Hill. But she is departing with some advice for other communications staffers. “Don’t sweat the small stuff,” she said, suggesting staffers don’t have to engage with every news cycle. Ferrier advised building a network of people you can turn to when faced with a difficult situation and also stressed the importance of personal relationships, including with the press.